What happens after I purchase my voucher code? After purchasing this product, you will be sent a unique Kogan Mobile voucher by email within 24 hours and a Kogan Mobile SIM Starter Pack by post. Once you have a Kogan Mobile SIM Card, simply visit the Kogan Mobile activation centre to redeem your unique voucher. You will be able to activate and start using your MEDIUM 30 Day plan without any additional charge. For those who want it all without having to spend it all, a 30 Day MEDIUM Plan strikes the perfect balance between awesome inclusions and incredible value. Incredible value prepaid plan – no hidden fees! We encourage everyone to compare our prices. If you’re not with Kogan Mobile, you’re probably paying too much! Switching to Kogan Mobile is quick and easy in just a few steps. For peace of mind, you can even set up ‘auto renew’ to ensure you’re never caught without calls, texts and data. Kogan Mobile is fast. Really fast. Take advantage of faster speeds and excellent coverage thanks to blistering 4G. All you’ll need is a 4G enabled handset and connection in a 4G coverage area. To check coverage in your area click here. Want to keep your existing number? No problem. When signing up, you can choose to keep your existing number or get a new one – it’s that simple! Say goodbye to bill shock! Kogan Mobile has absolutely no hidden costs – no flagfall fees, no payout fees, no additional charges and no unlocking costs. You’ll never receive a nasty surprise in the mail again. Enjoy visual voicemail without limits. Browse through an unlimited number of voicemail messages for easier, quicker playback. Not available on some devices. On Kogan Mobile you’ll have heaps of blistering fast 4G data to WhatsApp, Viber, Skype, FaceTime and send high-res photos to family and friends overseas. Prefer to just call? Add an International Call Pack to stay in touch the traditional way. The unique Kogan Mobile voucher included as part of this product is non transferrable and cannot be redeemed for cash. Voucher expires at 11:59pm AEDT on 31/12/2019. Activation or recharge must be made before the voucher expiry date. Voucher does not apply to subsequent recharges. Voucher cannot be used in conjunction with any other vouchers or promotional offers. For information about how to use Kogan Mobile vouchers, click here. *Unlimited refers to national standard calls & text within Australia. Personal Use and Fair Use policy apply. All Kogan Mobile Plans are prepaid. The full amount of each Plan must be paid upon activation, recharge or purchase of a voucher. A Kogan Mobile SIM card must be ordered from kogan.com or dicksmith.com.au before a Prepaid Plan can be activated. SIM delivery takes up to 10 working days, after which you can activate your Plan. Standard calls include: calls to standard national fixed lines, standard national mobiles; calls to 13, 1300 and 18 numbers and calls to voicemail. All for use within Australia. For additional premium services like international calls, calls to premium numbers and call forwarding, purchase the Premier Access Bolt-On. Unlimited Plans do not include calls and SMS to international numbers, calls, SMS and data used when roaming, premium & pre-routed SMS, voice call diverts, video calls, use of the VHA network for commercial purposes or re-sale & any voice call, SMS or MMS that is re-routed by a third party and/or re-routed to an international destination or to a premium number or service. The ‘per 30 day’ pricing is provided for reference only. Prepaid plans do not include calls and SMS to international numbers, calls, SMS and data used when roaming, premium & pre-routed SMS, voice call diverts, video calls, use of the VHA network for commercial purposes or re-sale & any voice call, SMS or MMS that is re-routed by a third party and/or re-routed to an international destination or to a premium number or service. Data sessions rounded to the nearest KB. Once data inclusion is exhausted, you will need to purchase a data pack or recharge to continue using data. Unused data expires on next recharge, the beginning of the next 30 day block or expiry date of the recharge, whichever is earlier. For 30 Days Plan: data expires after 30 days or upon next recharge, whichever occurs first. 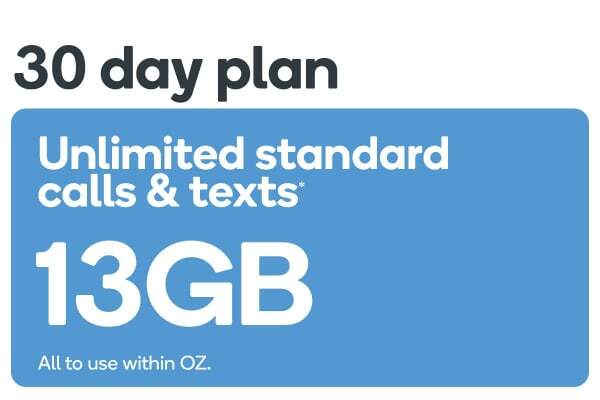 For 90 Days Plans: Comes with 9GB (SMALL 90 DAYS Plan), 39GB (MEDIUM 90 DAYS Plan) 60GB (LARGE 90 DAYS Plan) or 120GB (EXTRA LARGE 90 DAYS Plan) Total Data, split into 30 day blocks as per plan table, which is replenished every 30 days. If Data Per 30 Days is exhausted before 30 days has elapsed, access to data will cease until the beginning of the next data 30 day block (if any), or the customer recharges or purchases a data pack. For 365 Days Plan: comes with up to 37,376MB (SMALL 365 DAYS plan) 161,963MB (MEDIUM 365 DAYS Plan) 249,173MB (LARGE 365 DAYS Plan) or 498,347MB (EXTRA LARGE 365 DAYS Plan) Total Data, in each case split into 30 day blocks as per prepaid plan table from days 1 – 360. From days 361 – 365, 512MB (SMALL 365 DAYS Plan), 2219MB (MEDIUM 365 DAYSPlan) 3413MB (LARGE 365 DAYS Plan) or 6827MB (EXTRA LARGE 365 DAYS Plan) will be added to the account. 1GB = 1024MB. If Data Per 30 Days amount is exhausted before 30 days has elapsed, access to data will cease until the beginning of the next 30 day block (if any), or the customer recharges or purchases a data pack. T&Cs and Fair Use Policy apply. For full details about the available prepaid plans please click here. T&Cs and Fair Use Policy apply. Kogan Mobile Prepaid Plans are sold by Kogan Mobile as agent for Vodafone Hutchison Australia Pty Ltd or its subsidiaries (Vodafone). Once the Kogan Mobile service has been activated on koganmobile.com.au the Kogan Mobile service is provided by Vodafone in accordance with Vodafone’s Standard Form of Agreement. Details on inclusions for Kogan Mobile Plans are available at koganmobile.com.au/plans. Kogan Mobile works with most devices. If you're looking to upgrade, check out phone and tablet deals on compatible devices at Kogan.com. Browse, socialise and stream with complete freedom thanks to 13GB of data. 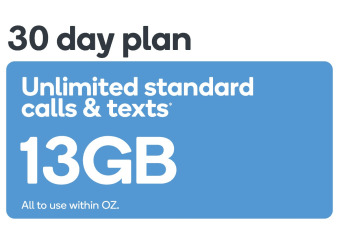 Enjoy unlimited standard calls and texts to use in Australia. Universal Tri-fit SIM delivered straight to your doorstep at no extra cost. This Product is offered and supplied by Kogan Mobile Australia Pty Ltd pursuant to the Terms and Conditions.